Holy Resurrection Greek Orthodox Church has been serving the Low Country's Orthodox Christians since 1990. We have been blessed with steady growth; our beginnings were humble. Early services were held in a parishioner’s living room on Hilton Head Island, later Divine Liturgies were celebrated in conference rooms at the Shoney’s Inn and Comfort Inn hotels. For a brief time, Christ Lutheran Church hosted our Orthodox services on Saturdays. Then in 1995, Holy Resurrection moved to its second floor location in Heritage Plaza (Hilton Head) and parish members and visitors worshipped there for eleven years. 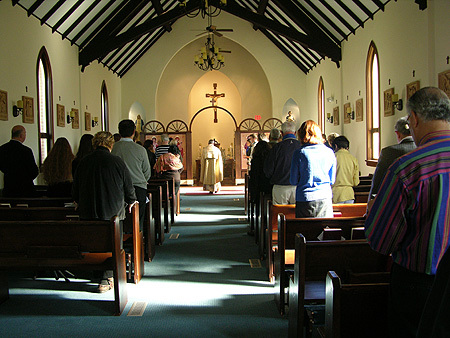 In September of 2007, thanks to the blessings of our Lord and Savior, Jesus Christ, we continued to foster our growth.Holy Resurrection now conducts weekly Sunday services at St. Andrew’s Chapel, located on 220 Pinckney Colony Road in Bluffton, South Carolina. Our mission church serves a Pan-Orthodox community; the Divine Liturgy is held in English and many nationalities make up and represent our parish family: Armenian, Bulgarian, Greek, Lebanese, Palestinian, Romanian, Russian, Serbian and Syrian. Among the Orthodox priests who have served our parish are, in chronological order: Father John Caparisos, Father Anthony Stratis, Father Nicholas Spirakis, Father Nicholas Trivelas, Father Nicholas Capilos and Father Peter Telencio. Currently, the Divine Liturgy is celebrated each Sunday, 10:00 am, St. Andrew’s Chapel, by Father Peter Telencio. Following the Liturgy, we welcome everyone to join us in the church hall for coffee hour.